A poor boy from a Buenos Aires shanty town, Diego Maradona became a genius with the soccer ball, kicking his way to the heights of South American, European, and world soccer, yet his struggles with the pressures of life inside and outside the game repeatedly threatened to tear him and his legend down. Hero or villain, one thing about Maradona is certain: He was the greatest soccer player of his generationand perhaps of all-time. Never before has the legendary Maradona given us his extraordinary story in his own wordsuntil now. From his poverty-stricken origins to his greatest glories on the field, Maradona recounts, with astonishing frankness and brilliant insight, the pivotal moments of his lifethe pressures of being a child prodigy, the infamous semi-final game against England in the 1986 World Cup, an incredible turn-around and the dream-turned-sour at Napoli, and the shame and disgrace of his positive drug test at USA 1994. In this amazingly honest autobiography, we see inside the mind of one of the most talented, controversial, and complex sportsmen of our timesa man torn between the demands of corporate club bosses, the fans, the media, and his own tempestuous personal life. 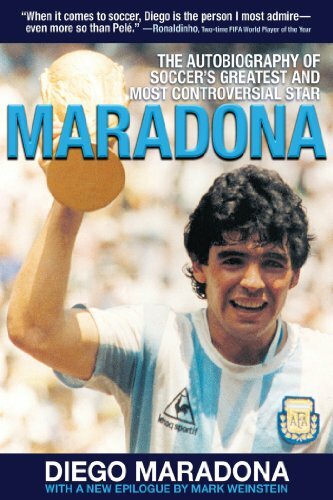 With a new epilogue exclusive to this paperback edition that brings Maradona’s remarkable story up-to-date and more than eighty wonderful photographs, Maradona is a confessional, a revelation, an apology, and a celebration. If you have any questions about this product by Brand: Skyhorse Publishing, contact us by completing and submitting the form below. If you are looking for a specif part number, please include it with your message.